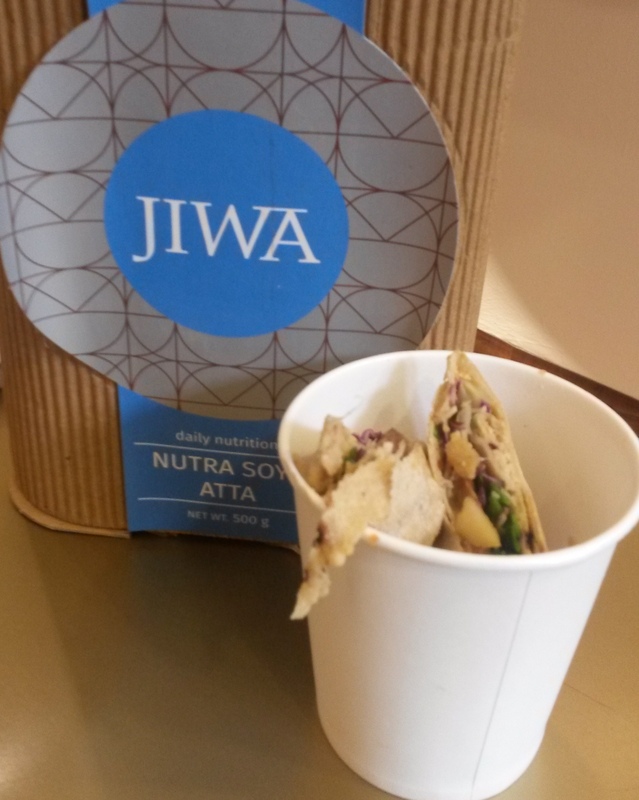 If you were to look at a live example of ‘forward integration’ then Jiwa it is. 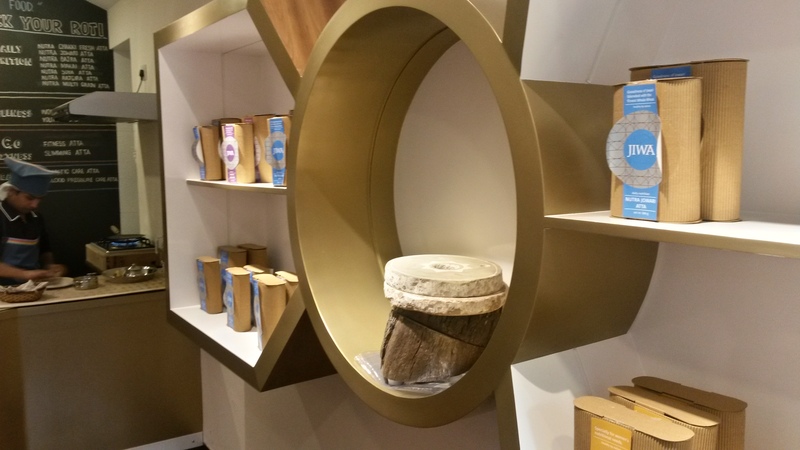 From the business of milling grains to opening an exclusive experience centre and a retail store a few months back to now conceptualizing a health café selling wraps made from their very own atta. 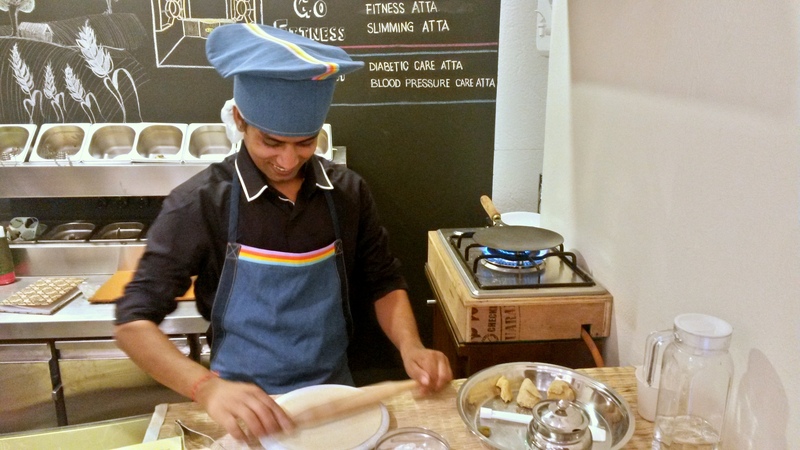 The Jiwa experience centre/café is located in the Bandra lane which houses other popular eating options like Gostana and the Elbo Room. With all the binging that I do almost every day, this invitation came as a reprieve. 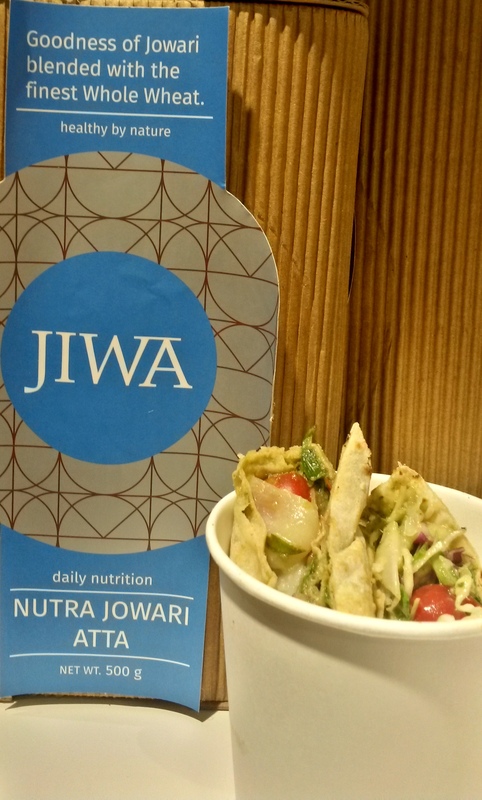 Jiwa is a brand of packaged flour which comes in varied options of grain and vegetable mixes. Ranging from Rs 85 a kilo to Rs 150 they use wheat flour as a base and then mix it with other grains like Jowar, Bajra, Corn, Rajgira (Amaranth), Soya etc. They also attempt to get in goodness from seeds like fenugreek and flax and vegetables like spinach and tomatoes. They come in 12 variants, the Chakki fresh, Diabetic, the popular slimming atta etc. It serves healthy food, a concept which is here to stay in my opinion. The café with a minimalistic decor has very limited indoor and outdoor seating. Their menu comprises wraps and the customer has a choice on the type of roti (from the 12 variants) the type of filling and the kind of sauces. They also do a couple of coolers and desserts. And yeah, they do not serve coffee or other hot beverages! Exotic veggies in balsamic, Salsa and peanut sauce in a Multigrain wrap I would call this a ‘Filler’. The crunch of the peanuts and the veggies with the warmth of the wrap make it good. I would have loved to have the salsa a little zingier though. Chargrilled fruits, Hummus in a Soya wrap I would call this ‘Interesting’. Have you ever had grilled jackfruit in a wrap, I did. 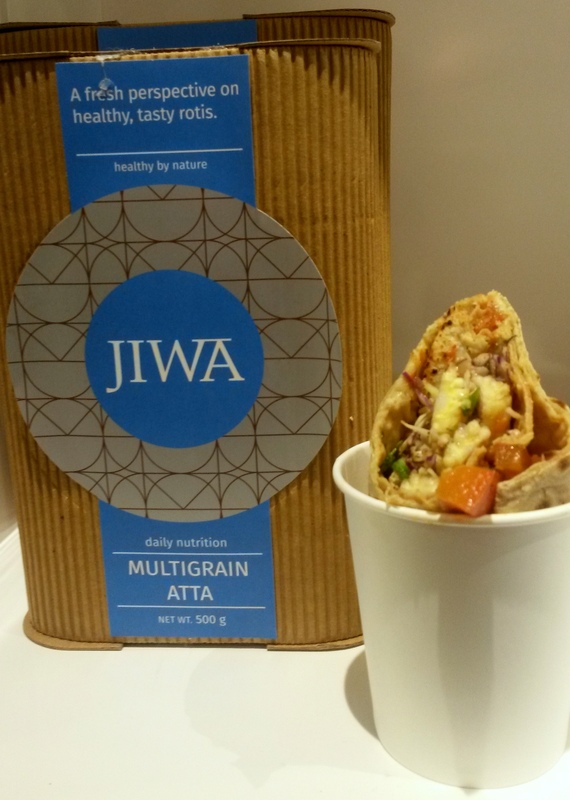 Apple, pears and jackfruit grilled with chilli and hummus made the wrap sweet, tangy and spicy. The hummus did not add much to it, did not hamper it either. Grated coconut and scraped jaggery instead with the spicy fruit would be a winning combo I thought! Bhindi and Aloo, Asian Wasabi in a Slimming wrap I would call this ‘Desi’. The veggies were stirfried in Indian style and the Asian wasabi was the classic wasabi with raw mango extract and coconut. The slimming wrap had a flavour of its own from the tomato and spinach that go into it. Tofu in Paprika, Greek yogurt, in a Diabetic wrap I believe food only evolves every time someone experiments with it and this zesty wrap is a testament to it. Tofu cooked in orange juice with juliennes of the zest came out beautifully in the wrap. The scent of orange oils from the zest came to the fore and complemented the shredded tofu well. Also the diccocum wheat and the grain mix allows sustained release of energy for better sugar control for diabetics. Pineapple I am (Rs 75) Poached dices of Pineapple in yogurt. I had it in a jiffy; it was sweet ending to my meal. 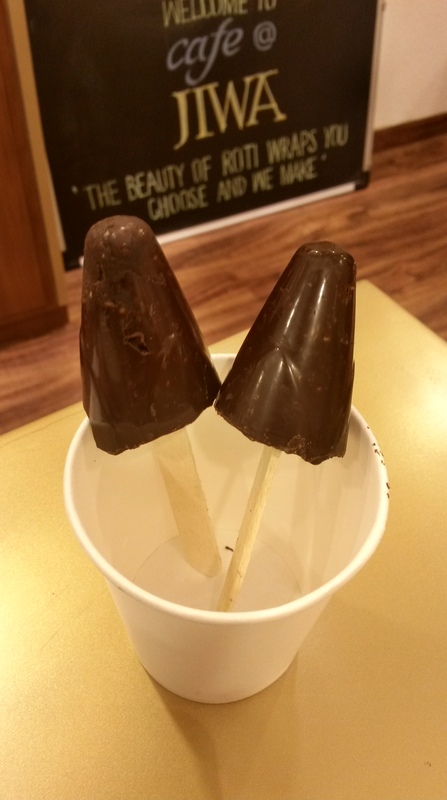 Chocolate Popsicle (RS 65) Dark chocolate with honey and crunchy muesli on a stick. It was more of a petit four to accompany a coffee. Verdict: Go try for sure. A much awaited concept, a gap that everyone is aware off but these guys are trying to fill. 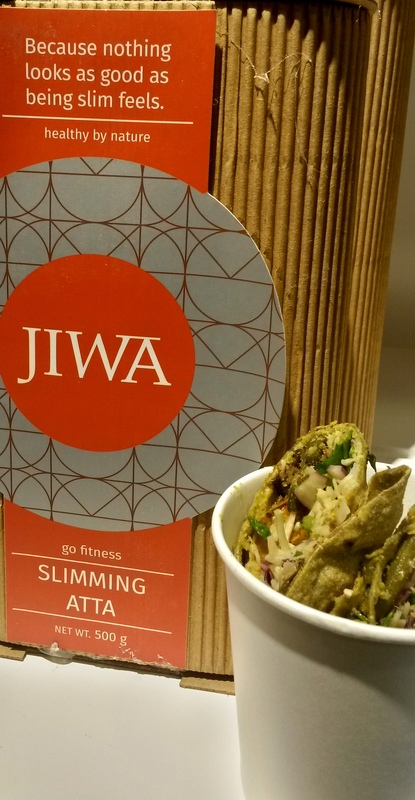 Jiwa albeit must be on its toes to keep their menu live and kicking. How about some slimming atta Quesadillas with sour cream for me on my next visit!!!! !